Photograph of the arched interior of the step well at Taulai, taken by Henry Cousens in the 1880s-90s. Taulai is a small town located in Maharashtra. In the Bombay list the subject of this photograph is described as "...an old step-well built in the Muhammadan style. It first descends a certain distance, then turns at right angles and continues down to the main shaft. Cross beams at different levels, supported upon the pilasters in the walls, divide the depth into storeys, increasing in number as the passage descends. There are no free-standing pillars." 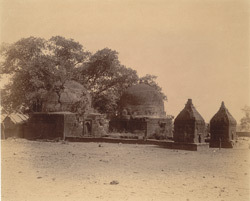 This photograph was taken as part of a tour of western India that Cousens carried out in the 1880s and 1890s. This was undertaken with the intention of recording places and structures of historical interest under the title 'The Archaeological Survey of Western India.' The year he visited Taulai, Cousens also made extensive studies of the temples found at towns like Akola, Nagapur, Sinnar and Changdeva to name just a few examples.